Rooms at the The Waldorf Astoria are stunningly decorated and well designed. Each room is individually decorated and showcases the timeless elegance and up-to-date convenience of the whole hotel. Amenities include large, comfortable rooms, flat screen TV, writing desk and chair, hairdryer, clock radio with MP3 connection and luxurious marble bathrooms. Accommodation ranges from the Deluxe Rooms which have a choice of king, queen or double beds, to the Luxury Suites which come in one or two bedroom layouts, have their own entry foyers and 24-hour housekeeping. 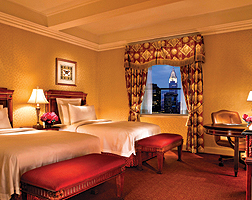 Regardless of the room you choose, you’ll find yourself calling the Waldorf Astoria ‘home’ by the end of your stay.